Peter Dutton has said he decided the government should introduce the Medicare co-payment while visiting his doctor. Dutton explained that people should contribute to visits to a GP because this would make the health care system more financially sustainable. This doesn’t strike me as a consultative policy analysis process. If Dutton had chosen to investigate the effect of this policy in a more consultative way, who should he have spoken to? Changes to the Medicare architecture should be undertaken through liaison between the Department of Health, the AMA [Australian Medical Association], the College of General Practice and State Health Departments. As a practicing GP, what is your opinion of the Abbott government’s proposed Medicare $7 GP co-payment policy? The proposed Medicare co-payment and its associated changes to Medicare have the potential to be very destructive to patient care for a couple of reasons. Firstly, it will deter people from discussing minor symptoms that they have with their GP, which often are a warning sign of more serious illness. This can lead to patients presenting with more advanced or severe disease, which may ultimately present a higher cost burden for the government. Secondly, the capacity for general practices to be flexible in their billing to patients with limited financial resources is significantly reduced under the proposed changes. Thirdly, hospital emergency departments will see a major increase in the volume of people with minor ailments presenting for care. Already, approximately 30% of patients presenting to an emergency department are non-urgent or semi-urgent conditions that could be managed in a GP setting. I suspect this proportion will increase significantly after the introduction of the co-payment. Finally, the co-payment may influence doctors to manage their patients in a less-than-ideal manner, as GP’s may try to protect their patient from additional fees. For example, the GP may not undertake a planned review of an infected wound the next day to see if the antibiotics are helping. Or the GP may defer referring the patient for pathology tests that might have picked up the serious electrolyte abnormality. There is a significant potential for the quality of care to deteriorate. What influence will the $7 Medicare GP co-payment have on the total price GPs will need to charge their patients rather than bulk-billing? Will there be an administration fee charged on top of the $7 fee? This will vary depending on the way the practice currently bills. Some practices charge all patients a fee with a gap. The proposed Medicare changes will reduce the amount that patients get as a rebate and they will therefore have a larger gap (however, the co-payment per-se won’t be paid). It is practices that bulk-bill patients who will see the most impact. For example, a general practitioner that chooses to bulk-bill a pensioner for a standard consult will have a 24% decrease in their income for that patient, and if they charge the co-payment without an additional fee on top, then their income will drop by 11%. As a general practitioner who runs a small business, these reductions in income have the potential to make the business unviable. My practice is considering its options but it is likely that we will simply have to charge concessional patients a gap of approximately $11 to maintain business viability (this will essentially keep our income stable). We are exploring other options such as reducing the duration of consults from 15 minutes to 12 minutes or reducing the number of supporting staff, but these options all have a negative impact on patient care. What types of patients will this co-payment affect the most? Do you expect certain types of patients to visit their doctor less often? This will have the most impact on patients who have chronic illness. In particular; the elderly, those with mental illness, diabetes, high blood pressure and children with recurrent infections. The impact will depend on how the medical profession and medical practices change their fee structure after the changes are introduced. It is unclear whether the large bulk-billing organisations such as Primary Health Care will continue to bulk-bill or whether they will charge the co-payment. I suspect that the overall impact of these changes will be much more severe than expected as many general practices like mine will change from conducting ‘mixed-billing’ (bulk-billing concessional patients and charging gap for non-concessional patients) to conducting private (gap) billing for all patients. What types of illnesses and conditions will people suffer from more severely if they don’t see their GP as often? Chronic illnesses such as diabetes, hypertension, asthma, heart disease and those with mental illness are likely to be the hardest hit. I also expect that some diseases will be picked up later. For example, a woman with a minor breast symptom who delays having it checked and it ultimately is found to be a breast cancer. Another example is that if a patient reports an unusual mole early and it is excised and found to be an early melanoma, there is very little risk of the cancer spreading and cure is usual. However, if the melanoma is diagnosed after spreading, it is generally regarded as incurable and the costs of newer chemotherapies for melanoma are astronomical in comparison. What affect do you think the GP co-payments will have on the overall health of the community and on the health budget bottom line? There is likely to be a negative effect on general health in the community. I suspect that we will see some diseases that have been declining in severity, such as heart attacks or advanced breast cancer, either plateau or even increase in frequency. I suspect the health budget will largely be unchanged, as while there will be a reduced number of general practice consultations and pathology/imaging rebates, there will be an increase in the number of more advanced diseases. There will probably be some cost-shifting as the more advanced cancers and heart disease will be cared for through the hospital system, whereas there will be less costs coming from general practice. Do you think it was responsible of the Abbott government to use the revenue from the GP co-payment to build a future fund to fund scientific health research? Increased funding for research is sorely needed. 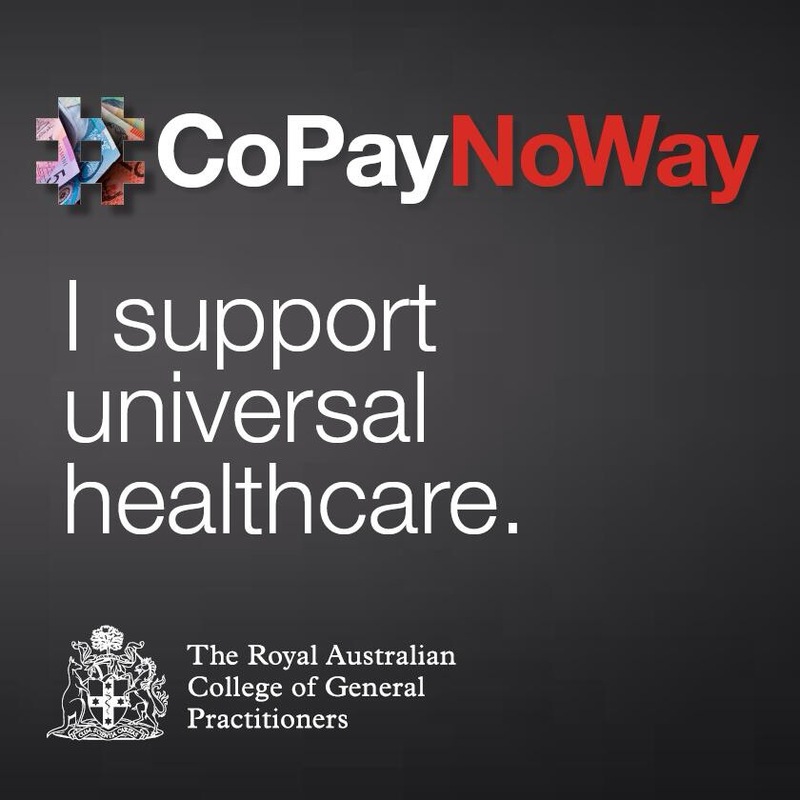 If there is a co-payment then I would support its proceeds going to research, however, I believe this funding should go to non-corporate research such as through the CSIRO or universities. I am concerned that corporate grants will be given for research by pharmaceutical companies that do not need government support. The funding to the states for the provision of hospital care should also be increased if the co-payment is introduced as the further demand will outstrip already limited services in our public hospitals. So there we have it. Not only some much needed facts, but clear analysis that shows the government haven’t thought through this policy. Either that, or they have and they don’t care about the detrimental impacts on our community. Sigh. Thanks Victoria for sharing your fact finding mission into those pitfalls befallen the proposed Abbott-Hockey GP Co Payment (hidden tax) contained in the LNP government’s first budget. What a stuff up they have made of it already and they haven’t been in government for 12 months. If this is the best they can do, then Australia has lost the plot by voting these lairs into office. Reblogged this on The Grovely Gazette.